Where did the time go, it’s Spring already! Here is Part 2 of my Tokyo Food Winter Guide, which covers everything from the insanely popular BAKE cheese tarts to delicious french-style yakitori. This post contains a bunch of the places I tried that are more fusion than my previous post, A Tokyo Winter Guide: Sushi Zanmai, Ginza Maru, and More. I visited Jiyugaoka for the first time this trip and I’m excited to share my finds! Jiyugaoka (part of Meguro ward) is a lovely neighborhood of Tokyo that’s fairly residential, mixed with a bunch of fusion restaurants and quaint storefronts. If you’re in the Jiyugaoka area this spring, be sure to visit when the cherry blossoms are in bloom because most streets are lined with these stunning trees! For more food and travel recommendations in Japan, check out my favorite Tokyo food blogger Maki’s site, Tokyo Eats. And lastly, thank you to Mizuha, Sena, and Haruka for showing me all these wonderful places. You girls know the way to my heart. Jiyugaoka’s main pedestrian road that’s lined with bars and restaurants. The stunning Sena showing me one of her favorite tapas places in Tokyo. Sakura Bar is definitely not your average bar. Serving a great drinks selection and phenomenal tapas, the restaurant is a super fun and cozy place to visit in Jiyugaoka. Sashimi drizzled with spicy oil for a slight kick. Dear hipster fellow, I swear I was trying to take a picture of the establishment–but since Sena and I proceeded to make great conversation with you and your group, you’re just going to have to deal with this pretty artsy photo! Tossed salad with fresh trumpet mushrooms. Quiche with shirasu (those small white fish often served with rice in Japan), topped with some fresh yuzu juice. This. was. delicious. Brussels sprouts and shrimps, sizzling in olive oil. These beauties are fluffy and sweet on the inside–definitely a must-try if you’re a sweet tooth. In case you haven’t heard, BAKE is the new kid on the block that’s selling ridiculously fresh and delicious cheese tarts. They have multiple locations in Tokyo and are opening up all over Asia (Seoul, Hong Kong, etc.) But either get here early, or try to catch them before they sell out because the line gets long. There’s a maximum amount you’re allowed to buy as well so go big or go home! Waiting in line for BAKE reminded me why Tokyo is the ultimate city for food fads–from Dominique Ansel to Max Brenner, people wait patiently for hours, only occasionally poking their heads out of line to check how much longer the wait is. For dinner, we visited a small tapas restaurant close to Jiyugaoka Station called Sakura Bar. As I have an affinity for tiny tucked away places that serve fun and unpredictable menus, I really enjoyed the atmosphere of Sakura Bar. It was great to see the tapas served using seasonal Japanese ingredients with Spanish-style cooking. Particularly, the quiche with shiasu (small sardines) topped with yuzu juice was delicious. Fun little story: we met a fun group of locals chilling at the bar and they mistook my ‘food’ photography as sneaky shots of their outfits (which by the way, was on point). After clearing that misunderstanding up, they were tipsy cheery and friendly–a perfect example of great company in this quaint Jiyugaoka restaurant. The stunning Tokyo Station, a major travel hub–worth a visit just to see the building itself! Échiré, a premium French butter, has a Tokyo outpost close to the Tokyo Station. They sell limited quantities of croissants, and everything you can think of that contains butter. But they go fast! I was able to grab one of their last Madeleines one afternoon and savor it in the Marunouichi Brick Square right next to the station. Cafe 1894 next to the Marunouichi Brick Square–great for a coffee break. The high ceilings and dark wood decor was a peaceful and nice change from the hustle and bustle of the Tokyo Station area. Nothing compares to a cup of coffee on a lazy afternoon. When in Tokyo, a visit to the Tokyo Station area is a must. Apart from being a major transportation hub that connects you to the rest of Japan, Tokyo Station is an iconic building that is stunning day and night. Right next to it, you’ll also find the Marunoichi (丸の内) area, home to Japan’s premier financial institutions. I love walking around the Marunoichi Red Brick Square, mainly becuase there are plenty of small boutique shops, as well as cafes such as LA BOUTIQUE de Joel Robuchon and Echire to visit. If you love buttery pastries, Echire is a must-visit. Although it is primarily targeted to the working crowd, thus the small storefront, the store sells limited amounts of fresh croissants, pain de chocolat, and more every day. I love their Madeleines and always end up buying a box everytime I go. Additionally, if you have some time to spare, Mitsubishi Ichigokan Museum is a hidden treasured located in the Marunoichi Square. This space was first conceptualized by the Mitsubishi corporation more than a century ago, and it was the first Western-style building to be constructed in Tokyo’s Marunoichi area. Now, the renovated Mitsubishi Ichigokan Muesum often showcases interesting exhibits focused on European art–previous exhibitions have included collaborations with Museo del Prado for example. Cafe 1894 used to be the bank business chamber in 1894 and has sinced been renovated as Mitsubishi Ichigokan Museum’s classic European-style cafe. Like the museum itself, Cafe 1894 is a gorgeous space to spend an afternoon. I was looking for a place to grab some caffeine and rest for the afternoon when I was pleasantly surprised. The high ceilings and dark wood decor were very different from the traditional Japanese coffee shops you find in areas such as Aoyama and Omotesando. But, as I was sipping on my coffee and savoring bites of my apple strudel, I felt transported to a very different time in Japan. To be fair, it could’ve been the Murakami book I was reading (Hard-Boiled Wonderland and the End of the World is possibly one of the most bizzare yet fascinating books I’ve read). But truly, Cafe 1894 is worth a visit if you’re in the area! French Yakitori & Wine Shaji Azabu-Juban–small storefront tucked away in Azabujuban. 100% worth the trek because the yakitori here is out of this world. It’s very much an undiscovered gem that locals love. Wine night with the girls for my last night in Tokyo! Truffles (lots of it! ), fig, prosciutto and arugula salad–sprinkeld with sea salt, this was out of the world. All my favorite ingredients (plus mozzarella) in a salad. Grilled vegetables with balsamic glaze–the grilled pumpkin and crunchy lotus roots were delicious. Special of the Day: fresh mussels in a white wine sauce. Shirako Spring Roll–I was skeptical about this dish, but it was actually really tasty! And the stars of the night: yakitori! Instead of classic shoyu or salt toppings, these yakitori were drenched in a delicious mustard dressing. 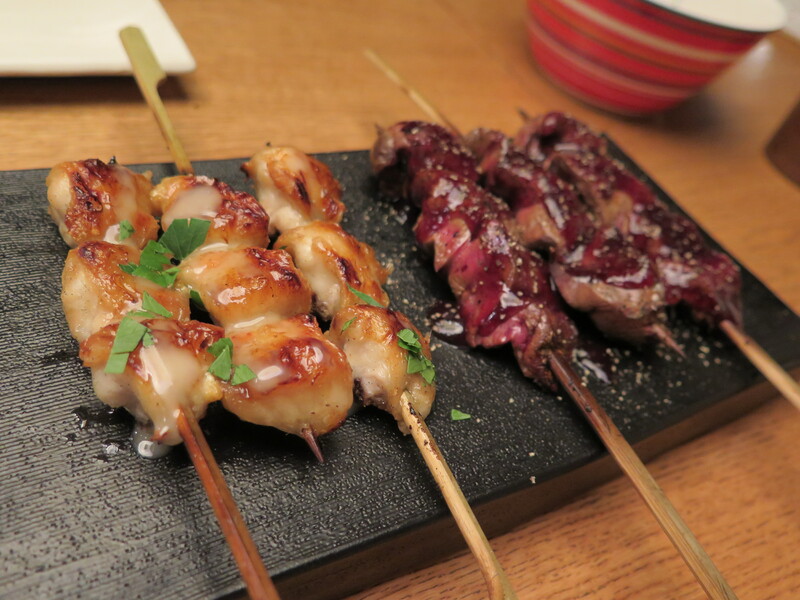 Classic momo yakitori with salt and pepper. Yakitori (left) with lemon glaze–this was really unique and the tanginess actually went really well with the chicken. Chicken liver with a red wine pepper glaze–this actually had the consistency of pâté and was deliciously creamy. TRUFFLE & RICE. Literally when they brought it out, the smell of steamed truffle and rice was just incredible. We devoured our bowls in less than a minute I swear. The restaurant has a seating area in the back that can fit a couple tables, as well as a long bar in front–it’s relatively small in scale, but if you can find this tucked away gem in Azabu-juban, you’re in for a treat. Small kitchen but big flavors–great wine as well! French Yakitori & Wine Shaji Azabu-Juban (I call it Shaji for short) was my favorite discovery this Tokyo trip. I have a weak spot for yakitori seasoned well and Shaji really knows how to impress with all sorts of French-style sauces. As Haruka, Mizuha & I were celebrating my last night in Tokyo, we really went all out. I enjoyed chatting with the friendly staff and hearing about all the off-the-menu speicals. For example, we were recommended to get some fresh mussels that came in that day, as well as Shirako Spring Roll. From the yakitori menu, definitely try the red-wine drenched chicken liver–it had the consistency of grilled pate and was really decadent-tasting. I love lemony sauces so the lemon butter glaze options were delicious as well. Last but not least, TRUFFLE RICE. There is nothing more hearty and delicious than ending a full meal with a bowl of well-seasoned rice topped with generous servings of truffles. I definitely could’ve had a whole pot of it to myself. I loved dining at Shaji and almost want to keep this place to myself, but I’d love to see more people visit it as well! ANDDD, that’s a wrap! I have one more post on a kaiseki meal I had in Tokyo coming soon, but onwards to more delicious adventures. Hopefully I’ll get around to sharing my Shanghai eats soon because that was such a fun leg of my Asia trip this January as well. Previous PostA Tokyo Food Winter Guide: Sushi Zanmai, Ginza Maru 銀座圓 and more!